All Things Lesbian: Don't Miss This: LESBIAN KNIFE JUGGLING?! Don't Miss This: LESBIAN KNIFE JUGGLING?! Following last year’s sold-out Los Angeles premiere, Melissa A. Kaplan is bringing her one-woman Daggers MacKenzie, on tour in the U.S. and abroad for an international debut at the Edinburgh Fringe Festival. 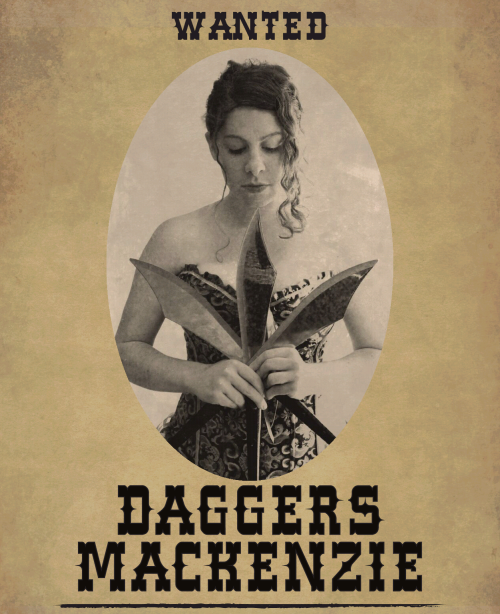 With 10 original songs, meticulously physicalized characters, and knife juggling, Kaplan tells the story of Emma “Daggers” MacKenzie, a naïve farm girl in 1894 seduced by a wild carnival madam into the scintillating world of circus, and eventually into life as a Wild West outlaw. The soundtrack, composed by Kaplan and recorded and produced by Michael Eisenstein (Letters to Cleo, Melissa Etheridge), employs a range of music genres, from waltzes to cabaret. Directed by Stephanie Abrams, award-winning director and founder of Kinetic Theory Circus Arts -- school of physical and circus theatre. TV OPPORTUNITY FOR LGBTQ-CURIOUS LADIES! SICK OF SARAH Go On Tour!